The Financial Times today published its ranking of the world’s premier business schools for management and leadership development. For the 18th consecutive year, SSE Executive Education at the Stockholm School of Economics maintains its top ranking in the Nordic and Baltic regions, climbing to number 21 globally from position 26 last year. Each year, the Financial Times publishes its ranking of the world’s premier business schools that offer various forms of executive education and higher management and leadership development programs. It is the most significant recurring annual ranking of executive education. “These are amazing figures! One must remember that there are about 14,000 business schools in the world, of which only a fraction qualify for the Financial Times rankings. We are at the top of this ranking, and are ranked higher than the University of Cambridge and Columbia Business School, for example. I’m so proud of that,” says Lars Strannegård, President of the Stockholm School of Economics. 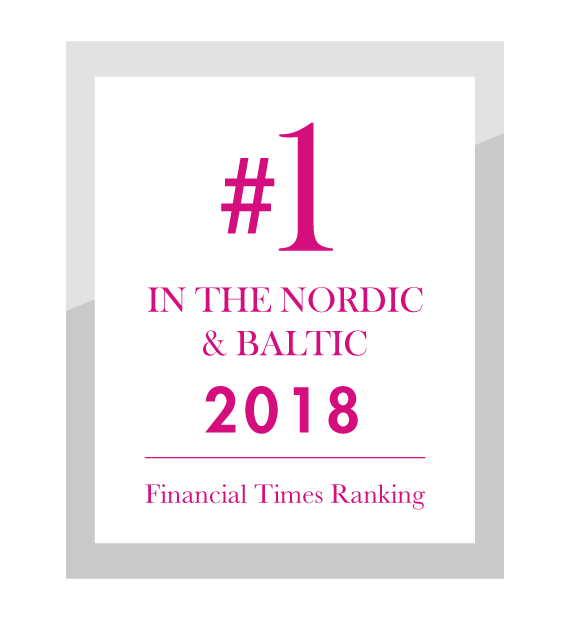 “We are incredibly proud to again be ranked as the best international business school in the Nordic Region. This serves as continued evidence that our participants and customers are satisfied. It shows the strength of our offer and the relevance of our programs,” says Anders Richtnér, CEO of SSE Executive Education. SSE Executive Education has been operating since 1969. Having several client companies as partners from the outset has been instrumental to its success. “I would like to thank all of our clients, participants and amazing employees for accomplishing this together,” says Richtnér.